Does anyone know if there's a setting for turning up the amount of these that spawn? Want to have a Dimension setup with a world with the spawn rate upped to insane. this mod is dead? or it's alive? It probably won't be updated until Minecraft Forge is updated, which is being rewritten from scratch. Do these structures only spawn in vanilla biomes or are they compatible with things like biomes o' plenty? Thank you! 👍 You the real MVP. How do I add different types of tools and armor to the armor quality indicators? Example, adding silver swords or copper picks or steel armor. Whoa. 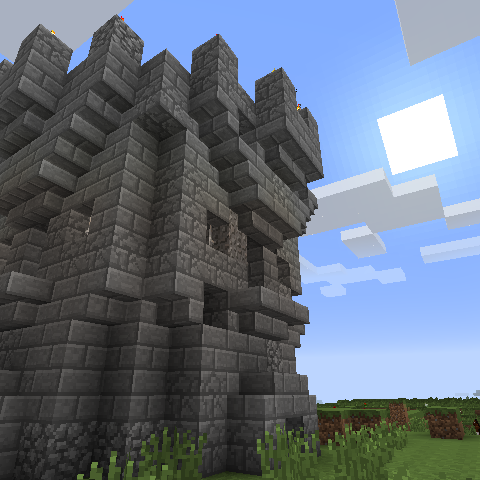 These dungeons were fun way back in CrazyCraft days (1.7), but in 1.12.2 the structures are so much more refined. Not the same towers and the same hallways anymore. Looming sandstone towers, vine-covered heaps in swampland, really fun to use as bases of operations. And down those spiral stairs, no idea what to expect. Kudos for deciding on shorter hallways with a higher density of spawners. A siege of one of those wide-open crypt chambers can take 2 hours, even then I have to chip my way through the walls to take out spawners. I can go through a stack of fences, blocking off open hallways so I can fight on one front at a time while zombies pile up. Actual adventure. Other rooms have different strategies, and the nether levels are just insane ... and a great source of Nether blocks. Great work. These dungeons are terrifying and way, way too difficult. I found a book marked 'statistic's' and it says something like 82 mob spawners? x.x Stuff spawns too fast, in full armor and the archers are terrifying. There's fun and then there's masochism. I was looking through the config, and i came across the random value. Does anybody know what would happen if you put the value to true? Really wish we could disable zombie shields with an Axe. If a zombie spawns with an Axe, they'll disable your shield, but you can't do the same to them, so they just randomly block hits completely which is annoying when you've got 3 or 4 zombies on you and have to maintain distance. is there an option for the mobs spawned from the dungeon spawners, like a blacklist of what items you don't want them to be holding? Before any other important questions are asked here. Is this mod still being worked on or has it been abandoned?